The project of the water gatherer of the Hungarian House. The project of the water gatherer of the Austrian House. According to one significant architect of our century the order of these spaces, which are formed architecturally, could also recall the order of the universe and we will have the real experience when this creation make us hear the voice of the universe. By creating the Europe Place we have tried „to compose such orchestral composition“ whose parts are the sounds of the respective european regions. The basic idea of establishing the Europe Place is linked closely to the Millennium and to the pursuit of our country to accede in the European Union and it also shows the common roots of the european culture. 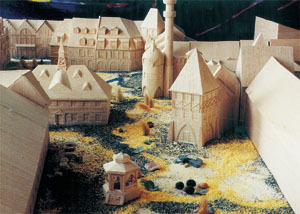 The wooden model of the work. The essence of the architectonic solution is that the individual buildings of the square present the architectural signs of the european countries and regions of Europe in a styled form. The buildings have to show the idea and the essence of the respective architecture. The new square forms the colourful unit with the architectural monuments from the past and it evokes the spirit of the missing medieval square erased in the course of the years. „The zones of living have also their hierarchic categorisation: the more significant are situated inside the central parts and the less significant buildings in the outskirts. The town where we live is the reflection of this permanent moving - it is the montage of a history. When something new is being built, certain new solution of its meaning - as the one from among the many possible solutions - is introduced into the town which already bears the casual traces of the previous eras.“ (Dezső Ekler: Ember és háza). 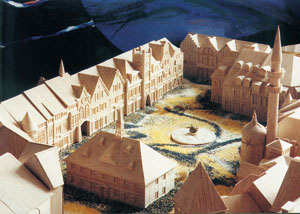 The model of the work with the Transylvanian House in the foreground. The Zichy Palace is one of the most beautiful buildings at the Klapka Square in the centre of Komárno. The arched passage of its main portals leads to yard of the palace with the park, where the towers of the Europe Place behind the Music Pavilion can be seen. 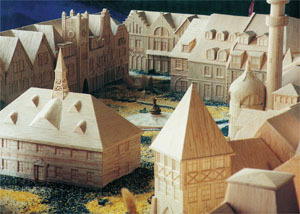 The Europe Place creates a little town quarter with its own life, however, it is closely linked with the history of the town and with the structure of the organism of the town, which was established spontaneously and organically during the long centuries without any plan or interference. The rectangular shape of the square is also indicated by the need for the direct connection with the structure of this organism of the town; these communications enable the easy access to any place in the centre of the town. The neighbouring plots have built up the places from the street, however the use of the inside yards is not appropriate from the point of view of the development of the town. These plots could be linked with the Europe Place, so they get the new significance and become built up places. The network of the spacious residential areas, offices and the colourful streets with the shops and with the hustle and bustle precedes the establishment of the reconstructed passage-like structure of the municipal organism in its centre surrounded by the housing estates. In solving the Europe Place and its communication interconnection we have intentionally tried to create the internal hierarchic order. We have determined the way of building according to the importance of the Europe Place. The smaller and simpler houses at the optically important places and communication junctions alternate the larger and more expressive buildings at the square. The biggest houses can be found at the most exposed points of the square (the northern part). We have marked the most significant points in the structure of the square. The towers and roofs with smaller towers emphasize according to their significance the meeting points of the communications´ vertical lines with the places by the corner buildings. The gates in the connecting streets assist in unifying the two sides of the rectangular square which are almost 75m long. So the two opposite parts of the place have become completed, but at the same time the open space vertical in relation to these parts got more significance (the absence of the southern side of the square, which, however, enable its interconnection with the Zichy Palace). The outlook of the buildings is in accordance with the proportion of its division. The roofs with their size decided indirectly determine basically the character of the buildings. We did not consider the height of the eaves as the binding and invariable one. The eaves and the windows divide the facades horizontally, while the fixed determined facades determine the building vertically. The result of applying this regulation is that the buildings show the identical rate of space at the places with the same significance. The square provides for the outstanding possibility for each house to get used. The fountain and statues reduce the intensity of the building up, according to the scale of the square. The square is linked in the southern part with the Zichy Palace by the Tower of Matthias Corvinus (the House of Transylvania) or with the House of Germany, respectively, in front of which the richly decorated wood bell tower is situated. The top of the House of Transylvania is decorated with the Sun and the Moon as a symbol of the nation of Siculs. We have situated the Apple of the Land at the top of the whorled ground between the House of Transylvania and the House of Germany, this piece of art was made from forged iron. An open-air theatre can be found in front of the House of Germany, which commemorates the theatrical past of the building and it is also one places where the cultural events in the town take place (The Komárno Days, The Summer Cultural Festival). The Millennium Fountain is situated in the middle of the square; we have indicated the directions and the distances of the respective european capitals on the edge of the fountain. The Europe Place is linked with the centre by the Street of the Singing Sea from the eastern side, which is small and narrow and entices for a nice walk. The Greek House shows off against the other houses with its beauty and playfulness. The Street of Northern Star leads to the square across the stairs from the northern side. The square will be accessible from the western side, where the County House is situated, through the Street of Brother Sun and the Street of Sister Moon, which is now being constructed. We can get to the Europe Place from all cardinal points across gates and streets and the dynamics of the experience from the square is improved with the kinetic - esthetical experience. It is not possible to look over the whole square from one point of view. The part we are able to look over refers to another. We have to go round the whole pile to look over the whole structure of the square. The EUROPALIA shopping centre with its small shops, supermarkets and with the fast food facilities is situated on the first floor under the square. We have created the specific small underground town when we linked the square with the cellar system of the Zichy Palace. An indoor garage with the space for 85 cars and a technical devices of the building complex is situated on the second floor under the square. The Europe Place is situated on 6.500 m2 and the built up space is 25.000 m2 on all floors. There have been destroying earthquakes several times in the town, when most of the historical buildings were demolished, so many of the civil buildings were rebuilt in a form of Historism of the 19th century and in a form of modern architectural ideas of the 20-30 years of 20th century. 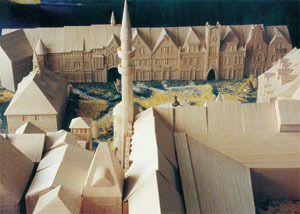 The Europe Place follows from this urban and architectural concept, which establishes a new cultural, social and commercial centre near the main square. There are the buildings more tied together with the tradition and also the buildings where the fantasy of the designer got more space. This is our subject picture of Europe: we see the countries, regions and architectures in this way.